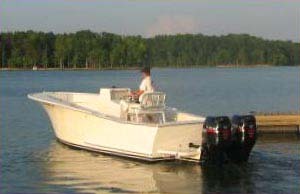 SPORTFISH 24 is a capable inshore or offshore boat with custom high end sportfishing boat looks. She has a deep Vee bow with flat keel and spray chines providing quick on plane transitions and a comfortable ride. Fuel capacity is up to 150 gallons. She is built of cold molded plywood and epoxy. Permanent frames are used as building molds. A frame kit is available which includes frames, longitudinal girders, transom pattern and sheer harpin pattern. Estimated cost for quality construction materials (not including power) is $28000. This cost includes a high level of outfit and finish you can be proud of after putting the effort into building this fine boat. 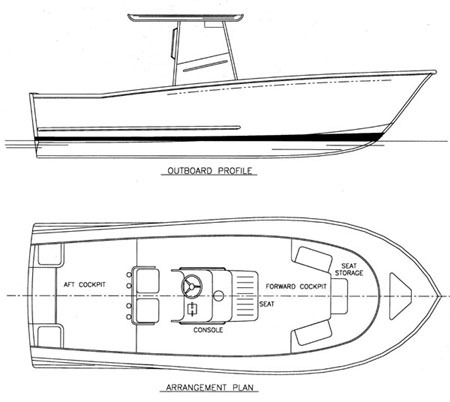 Purchase and Download Study Plans for the SPORTFISH 24 for $5.00 in PDF format (zipped file). 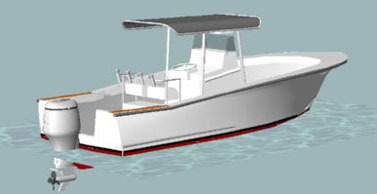 Purchase Construction Plans for the SPORTFISH 24 for $210.00 for delivery by US Postal Service.